Globe-trotting, note-jotting Robin Esrock opens up about what it really means to be a travel writer. In 2004, Robin Esrock was riding his scooter to work as he did every day, when a car went through a stop sign, rode straight into Esrock, and broke his kneecap. Horrible and traumatic, right? Well, not for Esrock. He asserts it was the best thing that ever happened to him. Eight months after the accident and almost completely healed, he received a $20,000 insurance settlement. With a degree in journalism from Rhodes University already under his belt, along with a handful of other careers—from being in a band to creating website—Esrock decided to put his new, small fortune toward an open-ended ticket to travel around the world. 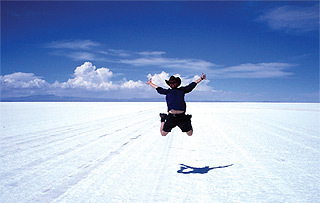 Esrock took the whole year off to visit 24 countries and five continents. During that time, he blogged every week and took pictures, mainly to share with his family and friends. “But that led to a column in the newspaper,” Esrock says, “and when I got back, I’d realized that I’d somehow become a travel writer.” He started receiving offers to go on more trips, and a year later he was published in 12 major newspapers around the world. To most, travel writing sounds like a dream job. The thought of lying on a beautiful island and being paid to write about it seems easy and attractive enough. Well, that’s not entirely true. Esrock explains that first and foremost, you have to love to travel—and that doesn’t really mean business class and five-star hotels. According to Esrock, travel writing is a lifestyle, not a living. With that idea, he came up with a concept for a TV show based on the contrast between living it up in the most amazing destinations around the world, and the pressure that he’s under as a writer. “I brought in Julia Diamon, a travel writer from Toronto, and the two of us got a TV show with OLN [Outdoor Life Network],” Esrock says. The show is called Word Travels, and so far they’ve filmed in 26 countries and will be shooting their third season in 2010. It’s recently been picked up by National Geographic’s Nat Geo Adventure channel worldwide. That seems easier said than done, because traveling can be very expensive, but you don’t need a lot of money. There are student programs, exchange programs, swaps, and even wwoofing (WWOOF is the World-Wide Opportunities on Organic Farms organization, where you can volunteer to work on organic farms. There are over 600 locations to do this in Canada alone). 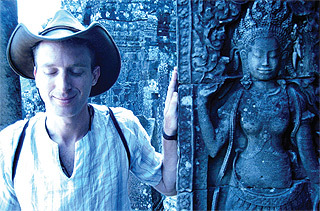 To read Esrock’s exciting adventures around the world, visit robinesrock.com, and head to wordtravels.tv to watch clips of his show, Word Travels. Here’s a highlight reel from Robin Esrock’s Word Travels show. Thanks for a marvelous posting! I seriously enjoyed reading it, you can be a great author. I will be sure to bookmark your blog and definitely will come back later on. I want to encourage yourself to continue your great posts, have a nice day!